Preliminary data will be discussed in this article. Statistical analysis of all the data has not been concluded and therefore only treatment averages are reported. Yield: One of the criteria that was set for the variety trial was that the fruit size needed to be between 2 – 4 lbs. At Meig’s Farm Magnificenza, Sephia and Kenza produced fruit that varied in weight between 3.28 and 3.96 lbs. Migdal and Magnificenza produced fruit less than 4 lbs at HGRH. The yield per plant was lower than expected. Several factors, i.e. environmental stress and pests, have contributed to the lower yield. Average yields in Southern Indiana is approximately 6,000 fruit per acer at a planting density of 2,904 plants per acre. 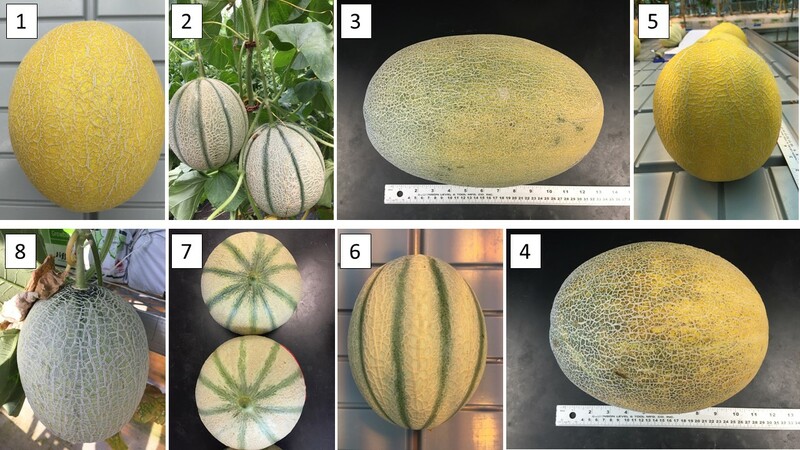 Productivity, depending on the variety used, in the high tunnel at Meig’s Farm was 50% to 343% higher than field grown melons. At the HLA Plant Growth Facility (HGRH) a 16% decrease in yield was observed with Rawan. The other varieties showed yield increases of between 6% and 225% compared to field grown melon. The worst performing varieties were Rawan and Rowena. 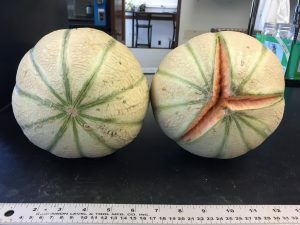 The very large fruit size made these varieties not suitable for vertical high tunnel production. At Meig’s Farm Magnificenza, Karameza and Kenza produced the highest yields followed by Sephia, Migdal and Tirreno. Magnificenza produced at Meig’s Farm was the only variety to reach and average fruit yield of 2 fruit per plant. Fruit yields of more than 4 per plant will be ideal for this production system. The much higher total number of fruit produced per acre in these trials are mainly driven by the much higher plant densities that were used (Meig’s Farm 11,805 and HGRH 13,280 plants per acre). Very few fruit were unmarketable. Unmarketable fruit included fruit that were too small or fruit with visible cracks in the exocarp. Kenza and Karameza were the only varieties that produced fruit with cracks. A few Kenza fruit actually burst open at the blossom-end. Charentais are known to crack when it receives too much water during the last 10-14 days of ripening. Quality: Variation in cantaloupe fruit juice pH values exists as a result of varietal differences and growing conditions. The approximate cantaloupe fruit juice pH is usually between 6.13 and 6.58. Sephia had lower pH levels at both trial locations. All varieties produced at HGRH, except Karameza, had a below normal pH level. According to the USDA Standards for Grades of Cantaloupe “very good internal quality” and “good internal quality” means that juices from the edible portion of a cantaloupe sample contains no less than 11 and 9 percent soluble solids, respectively, as determined by a hand refractometer. Only Migdal (at Meig’s Farm and Magnificenza (HGRH) produced fruit that almost reached the USDA “good internal quality” grade. All other varieties had suboptimal soluble solids levels. Fruit produced at Meig’s Farm were firmer than those produced at HGRH, except for the variety Rowena. In general fruit quality was suboptimal. In the next round of trials other varieties will be included and a lot of focus will be placed on increasing the number of fruit per plant, fruit size, finding the optimal plant density, pest control strategies and increasing the soluble solids content of fruit.